Last weekend’s Super Typhoon Haiyan made landfall in my family’s hometown. The devastation is so staggering, that I’m struggling to find words to describe how I feel about the losses and damages we have suffered from this. I spent two days agonizing over the fate of my relatives. But when I finally reached my brother, it filled me with renewed strength and great relief. He survived the onslaught, and for the last few days, he has been helping gather dead bodies. He is hungry and weary as food supplies find it difficult to arrive in the hardest hit areas. But beyond the colossal humanitarian challenge ahead, we must take the courage to face the truth: the superstorm was not just another natural disaster -- it was made stronger and more deadly by human-caused climate change. For too long, those countries with the greatest capacity to act and greatest responsibility for the problem have shirked their obligations to cut pollution as the science demands. That has locked-in climate change, and could lock-in even worse impacts to come. So I’ve taken a rare step as a public servant -- I’ve gone beyond the usual conventions to start an Avaaz petition. 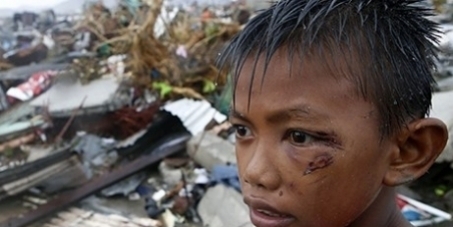 I’m appealing to Avaaz members to stand in solidarity with the people of the Philippines and all victims of climate change worldwide. Together our voices can push the governments meeting at the UN climate summit happening now to ratchet up pollution controls and help poorer communities with funding. The question that will determine our survival is: can humanity rise to the occasion? I still believe we can. Sign the petition today, and forward it to everyone, and I will deliver it personally at the talks.